Wait. There isn’t any evidence? Really? In the two seasons in which Fielder hit behind Cabrera, their man Miggy won back-to-back MVPs and back-to-back batting titles. 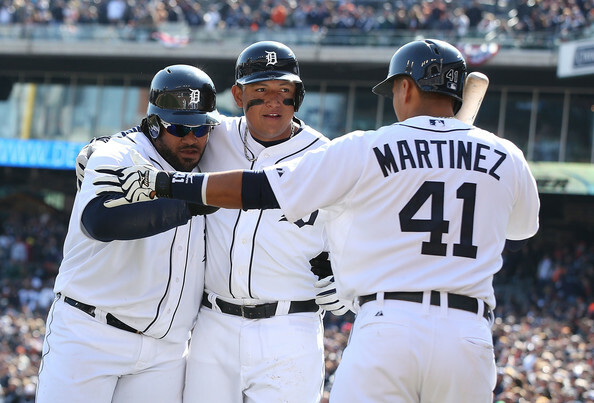 Cabrera’s on-base percentage also went up 14 points (from .403 to .417) in those two seasons, compared to his previous years with the Tigers. Meanwhile, his slugging percentage zoomed upward nearly 50 points (from .571 to .620). His home runs per season (from 35 to 44) and RBIs per season (115 to 138) also were way up. And his intentional walks (54 over the two seasons before Prince, 36 in the two seasons with Prince) were down. Even players who are at least remotely skeptical of the concept of lineup protection still think there’s something to it. But if you look past the circumstantial evidence in Cabrera’s trophy case, there are really persuasive facts that say otherwise. You’d think, for instance, that with a feared presence like Fielder behind him, Cabrera would have seen a lot more strikes over the past two years. Right? You would also think, we’re guessing, that Cabrera saw many more fastballs with Fielder hulking it up behind him. Nope. Not really, according to FanGraphs. Cabrera’s career first-pitch strike percentage: 58.6 percent. So where’s the evidence? It sure is difficult to find. Stark’s article bothers me. He concedes that, with Prince, Cabrera’s OBP, SLG, HR, and RBI all were significantly higher, and IBB were significantly lower. He then ropes in Dave Cameron’s work to argue that lineup protection is a myth because Cabrera didn’t see more fastballs or first-pitch strikes with Prince backing him up. Why would you ever throw fastballs or first-pitch strikes to Cabrera? Those seem like bad ideas under any circumstances– even if Cabrera’s eight teammates were eight Don Kelly clones. The lineup protection concept says that you have to throw to Cabrera when guys like Prince and Martinez follow him in the lineup, not that you have to lob him tennis balls. The significant improvements in OBP, SLG, HR, RBI, and IBB indicate to me that the protection concept is, to some extent, a behavioral reality. That’s not to say there isn’t a meaningful role for advanced statistics here. For example, it would be helpful to parse out the extent to which Cabrera’s improved PA results were due to pitchers taking notice of Prince in the on-deck circle and the degree to which they were due to Cabrera’s own continued improvement as a hitter. To waive your hands over those “traditional” metrics while chanting “Fangraphs” and “PITCHf/x” is nothing more than Sabrwashing in this instance, however. This entry was posted in ALDLAND and tagged barry bonds, baseball notes, dave cameron, detroit, espn, fangraphs, jayson stark, miguel cabrera, mlb, prince fielder, sabermetrics, tigers, victor martinez by AD. Bookmark the permalink.